Design student Lee Washington wants to make earbuds tangle proof by zippong them together like the seal of a sandwich bag. 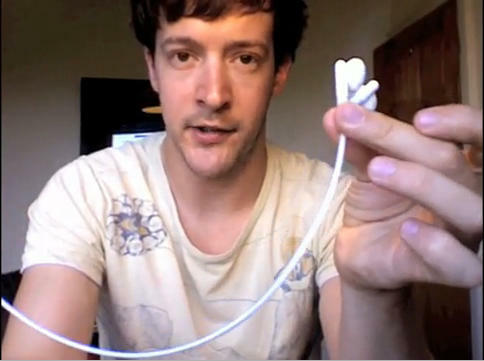 Here’s a great idea for making tangle-proof earbuds. It’s so simple, I’m surprised no one has thought of it before. To prevent your earbud wires from tangling when not in use, join them together using a Ziploc-like zipper. By pinching the two wires together into a single wire, they become tangle-proof, like a piece of thick, rubbery string. The two wires are simply unzipped when you want to use them. The idea was dreamed up by London design student Lee Washington, who has made a short video to demonstrate them in action — see below. As yet, Washington doesn’t have a manufacturer. He’s talking to his professors this week about patenting the idea. He now regrets making the video, which is fast becoming popular. He’s afraid his idea will be ripped off. Indeed. We wish Washington the best finding someone to market his brilliantly simple idea.